It has been acknowledged that Android smart phone is one of the most useful mobile phones on the market. To keep this feature, many manufacturers of Android phone have been working on improving the functions all the time. In result, people update their Android phones from time to time in order to get the new technology. And the users usually want to keep the data on the old Android phone intact and transfer them to the new Android. This article is written to offer you users the simple way to transfer data from Android to Android. 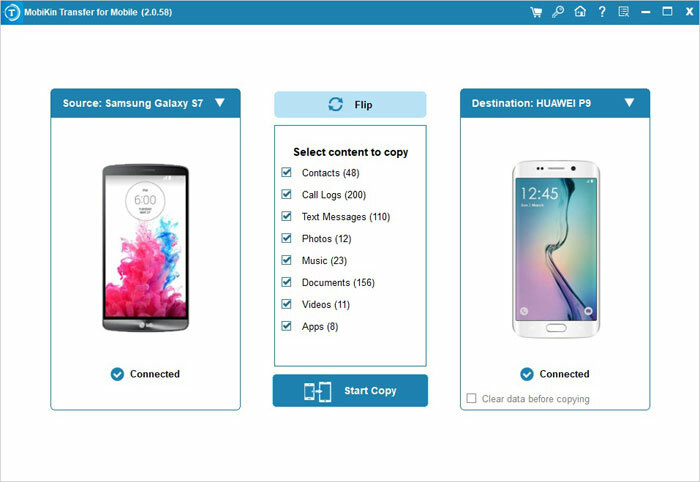 If the Android phone in your hand has its own file manager program like Samsung Kies to Samsung; HTC PC Suite to HTC, you can easily transfer the data to the computer. But transferring data between different smart phones is another thing. This is why we recommend the MobiKin Transfer for Mobile software. With it, you can transfer data from Android to Android without limitation. As for the compatible platforms, in addition to Android OS, BlackBerry, iPhone, Symbian and Windows Phone can be supported as well. Here is a small table of the specific compatible smart phones and the transferrable data. Check it out and then follow us to the next section. Samsung Galaxy S/Note 5/4/3, Sony Xperia Z3/Z2/Z1/Z Ultra, HTC One E8/M8/M7, LG G3/G2, Moto X Pro/X, Nexus 6/5, Huawei, etc. Related: Let the Android sync manager help you transfer and edit the Android data on the computer perfectly. Download and install the free trial version of the Android phone transfer tool and then run it on your computer. Connect the Android phones to the computer via USB cables and then the program will detect them accordingly. After that, you'll see the data transferrable in the middle menu as the following window shows. Mark one option of the data such as the "Contacts", and then click the "Start Copy" icon in the middle panel to start to transfer data from Android to Android. Besides, other data like music, videos, photos, apps can all be synced between Android phones. 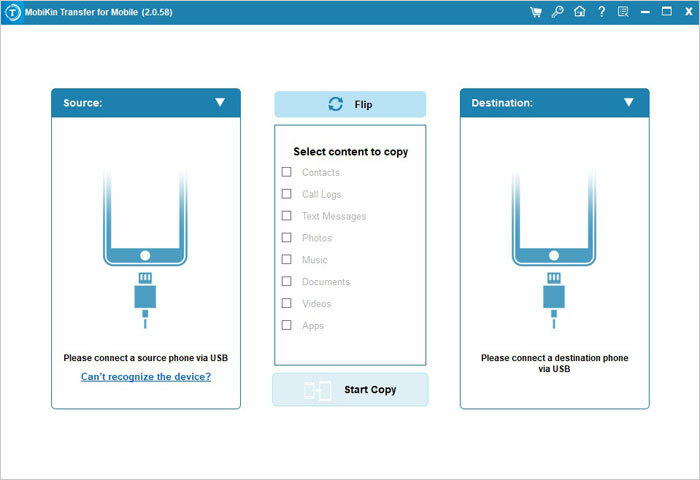 Pros: Transfer data from Android to Android with 1 simple click, and can also be used to transfer data between other devices, such as iOS, Symbian, and so on. Cons: Have to spend too much time to select and pick up the best phone transfer program on the Internet. Read more: How to recover files from Android micro SD card? In order to manage the Android data more effectively and conveniently, almost all Android users have picked up one or two different Android manager programs as their digital assistant in the daily life. In most situations, these kinds of software always can deal with all problems related to Android data management. So when you're planning to transfer data from Android to Android, you can take a free trial on the Android assistant on your Windows or Mac computer at first. If it is not available in this situation, you can try the above method again. Note: Here, please be noted that the assistant for Android you have chosen can support all Android brands on the market, and if you have no proper tool at present, we could like to strongly recommend you to take a free trial on the MobiKin Android Assistant program. With it, you're enabled to import or export data like contacts, messages, photos, apps, music, etc. between Android phones or tablets without hassle. Below is a detailed video tutorial to show you how to perform the best Android to Android Transfer program on your Windows computer. Pros: Save your time on selecting a proper phone transfer program for your Android devices, and solve all problems with 1 simple tool can greatly improve your working efficiency. Cons: Cannot support phones which are running on other operating systems. The operation of data transference between Android devices are little bit complex than the above method. Editor's Review: Which One is Better? Obviously, the methods recommended here are all available and you can use one of them to reach your goal easily. But just like the says going "Every coin has two sides", so here we can't directly say which one is better than the other. All you need here is to select a proper solution according to your own needs. For example, if you wish to have a simple operation, and wish to have an all-round mobile phone assistant program, then the Phone Transfer could be the ideal solution for you. Meanwhile, if you only need to transfer data between Android devices, and don't want to install more tools on your PC or mobile phone, then just make full use of the Android File Manager tool at your own will. [Proven Tips] How to Transfer Call Logs from Android to Android?